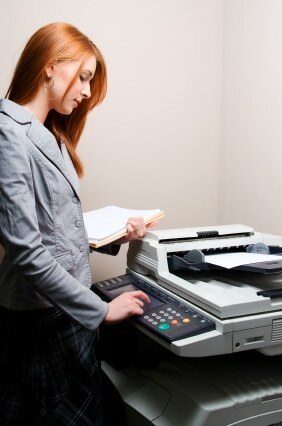 In the past, people used carbon paper or mimeograph machines when they needed multiple copies of a document. Hard as it might be to believe, if you only had a single copy of an important document, you often had to make copies by hand. That changed when Chester Carlson, a patent attorney from New York, copied hundreds of new documents for his job by hand. Because this became painful due to his arthritis, Carlson experimented with what is known as photoconductivity. His experiments led him to creating the first photocopy in 1938 from his kitchen. Eventually, Carlson sold his idea to the Haloid Company who took the concept twice as far. They placed dry ink on paper and called it xerography. In 1950, they started releasing their Xerox machines. Over those years, other companies started to produce their own brands of copiers, and some of them are still industry leaders of today. Canon introduced the first color copier in 1973. When the 1990s hit, we started to see scanners, fax machines and copiers integrated into a single unit. When combined with wireless Internet, users can produce copies from almost anywhere. As we can see this office technology has advanced greatly since its beginning years.